Photo from Flickr user *bri*, used under a Creative Commons license. As a kid, I took the Winchester Mystery House tour with my aunt. I don’t remember exactly how old I was, maybe around twelve. It’s a memorable tour and I still recalled a lot of it when I went back recently with friends. The house itself defies description; doors with nothing behind them, skylights in floors, rooms that were never finished or never fixed after the 1906 earthquake, doors disguised as cabinets… imagine 160 rooms with these types of bizarre features and the list could go on for a while. But the one thing the tour doesn’t do is explain conclusively why the house was built this way. 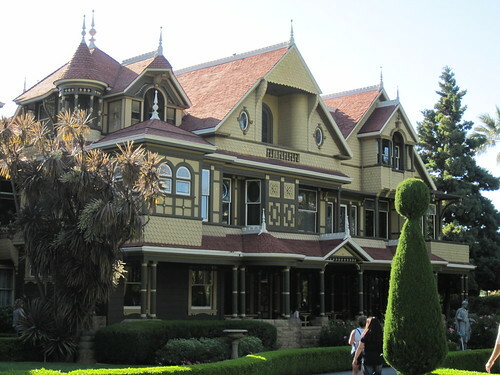 Rather, it posits the theory that Sarah Winchester was into spiritualism, as was common at the time, and was told by a psychic that she’d be haunted by the spirits of those killed by her family’s Winchester rifles unless she built a house that was constantly under construction. To put it another way she was allegedly building rooms and hallways faster than the ghosts could chase her. As though to provide evidence for this theory, the winding mile-long tour makes its way to the middle of the building where there’s a small room described as the seance room. It’s here, the tour guide explains, that Mrs. Winchester would hold seances to communicate with the dead. I suspect most people walk away from the tour with the impression that Mrs. Winchester was simply crazy, which is understandable. I’d also suspect that this theory is completely wrong, and an intentional deception to sell tickets. The recent essay collection Ghostland: An American History in Haunted Places by Colin Dickey includes an essay about the mansion. It’s a fascinating book, if you’re into American ghost stories at all I’d highly recommend it. While the book isn’t about debunking ghost stories in general it makes a good case against the official Winchester Mystery House tour explanation. Two of Dickey’s arguments stand out in my mind. First, there’s really no evidence that corroborates any of the details about Sarah Winchester’s spiritualism or reasons for building the mansion the way she did. Second, after her death the house was purchased by a theme park operator. However, I’d take this one step further — the tour itself contains a contradiction that’s pretty obvious when you stop and think about it. According to the tour, Mrs. Winchester was said to be very reclusive after her husband’s death. The only people she allowed on the premises of her mansion were her staff, construction workers, and occasionally her favorite niece. So if that’s true, then who are the people holding these seances with her? Normally in American style seances, you would have a group of people in a circle, sometimes at a table, maybe holding hands, with a medium responsible for contacting the spirits. If Mrs. Winchester didn’t have people over, who was participating in these seances? Her construction workers? For these reasons very little of the information in the tour should be taken at face value. Most of the information out there seems to either come from the tour itself, or secondhand through “ghost hunter” TV shows. Which is to say it’s not exactly credible. There are also simpler explanations to the “crazy” design of the mansion itself. After the 1906 earthquake, the building was damaged and significantly downsized. The “stairways to nowhere” the house is known for may have gone somewhere originally, and perhaps if Mrs. Winchester had lived longer they would have gone somewhere again. Since she moved out of the house after the earthquake it’s not clear how closely she was paying attention to the construction work anyway. The other consideration is Mrs. Winchester was suffering from arthritis in a time when pain medications weren’t very good. Her solution seemingly was to build fireplaces all over the house for warmth, and to build stairways with extremely shallow steps to minimize the amount she would have to move her knees. Changing the mansion to accommodate for additional chimneys and staircases that took up more space could have easily altered the house in ways that were unexpected and difficult to plan for, particularly considering she already had earthquake damage to correct. Lastly, Victorian architecture was a fashion, not a necessity; many Victorian homes were renovated frequently to keep up with the styles that were in vogue in the time. Which is to say Mrs. Winchester’s constant renovation was the norm in those days, but she took it to the extreme. Some of the quirks could have resulted from a sort of botched “cosmetic surgery” to the building. So while I’m glad those steep ticket prices they charge for the tour are going toward maintaining and preserving San Jose’s most infamously strange home, I wish they could do it in such a way that didn’t cast such a judgemental light on a woman who we truthfully know very little about. Notable people’s memories are often exploited, but in this strange case, it’s the lack thereof that provides ample room for exploitation.